The tiny moon Helene seems to be experiencing some kind of erosion based on new hires images acquired by the Cassini mission in orbit around Saturn. If this is true, this would be quite a mystery considering the moon’s tiny mass and almost total lack of any gravitational ability to shape it’s own surface. Surely this must be coming from external forces such as ring particles being dumped on the surface in one area and then slowly being shaken downslope by small impacts over a very long time. Maybe? Another color composite by Gordan Ugarkovic. And a bonus Helene crescent image with posterization effects removed by Wanderingspace. This is one of the tiny moons of Saturn seen up close around Jan 27, 2010 by Cassini. In case you do not recall, it is the moon responsible for some of the best ring disturbance movies of the mission. Recent observations of Saturn’s rings from Cassini reveal some vertical structure to the rings. Shown here are disturbances caused by Daphnis, a small moonlet that orbits within the Keeler Gap of the rings. We have seen much of these kinds of disturbances in the rings from tiny moonlets, but the Saturninan equinox finally provides us with an angle of sunlight that reveals such structures from the long shadows they cast. The tallest shadow seen at right is Daphnis itself. Yes, another movie of Prometheus disturbing Saturn’s rings. This is the longest clip and includes the most ring swinging action for your money. This version has been cropped and reduced down from the original. See here for a larger, wider view of the same animation (2M gif). Janus is a minor moon of Saturn. Seen here by Cassini from 32,967 km. From the raw images of the Cassini mission. This is Saturn’s tiny moon Prometheus causing a disturbance in some ring particles. Nothing really new to be said here as we have seen this featured in a few animations posted here before. This is just a nice image of that phenomenon with the addition of a nice glaringly over-exposed Prometheus. Prometheus disturbing the F-Ring as it passes. We have seen this animated before, but perhaps not from such a vantage point. This improved image of Epimetheus was released to the Cassini site yesterday and as compared to this more raw image post from December 8, it is most notably cleaner, processed in color and appears to be much sharper. This is a view of the moon’s more southern pole and there is speculation that covering a majority of this face is actually one large impact crater which could explain it’s flattened appearance. There also seems to be what looks like a deposit or “dusting” of material all over this face which seems to blanket flat areas and begins to fill some craters and other depressed regions. The moon is only about 70 x 50 km in size, approximately the size of a city such as Los Angeles. 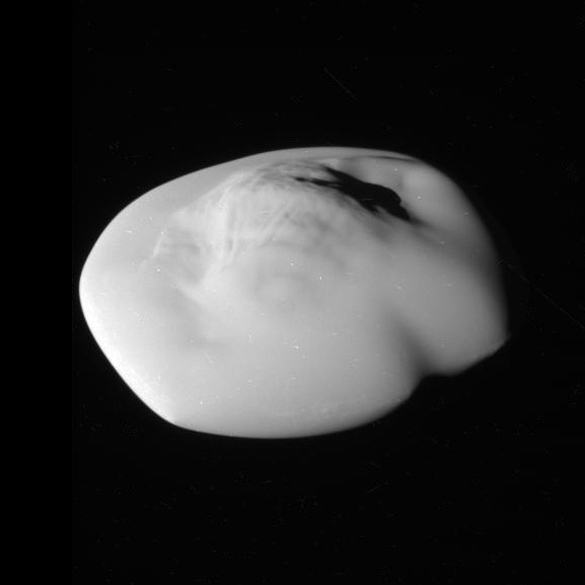 A new look at a minor Saturn moon Epimetheus. Image credit is Ian Regan, the same creator of this super awesome Saturn image. There have been some nice NASA animations of the interaction between some “shepard” moons and the rings, but this has to be the most impressive. There are some blank frames in there for gaps in the data… but the effect is still easy to follow.